February brought us some active weather didn’t it?! You could (no joke) write a full on thesis based just on the meteorology behind our train of storms but seeing as though I only have so much room here, I’m going to pick one of the features that was most noteworthy across all of our storms to discuss in this month’s column: mesoscale bands of heavy snow. So what are mesoscale snow bands and why are they so important to forecasting how much snow will end up on the front step after a storm? One of the best examples of mesoscale banding you can find was observed over the area in one of February’s storms. Snow was coming down at rates of 2-4" an hour over Portland and Lewiston in the heavy bands (purple lines on the radar map) while at my house in Yarmouth, we got a measly .4" during the same period (11 a.m. till noon). Even better, these bands hardly moved throughout the morning and into the early afternoon which resulted in some towns getting buried in snow while others not so far away escaped with relatively little. What causes these intense bands and why do some so close to the jackpot miss out? The answer lies in the dynamics in the mid levels of the atmosphere, roughly 10,000 feet above our heads. Way up there, a low pressure system is developing and ahead of it winds are shifting from SW to S to SE. This is pushing warm, moisture laden air west into the cold airmass and creating a warm front. This process involves the sharpening of the thermal gradient as well as convergence, both of which favour strong upward motion focused along the axis of the front itself. 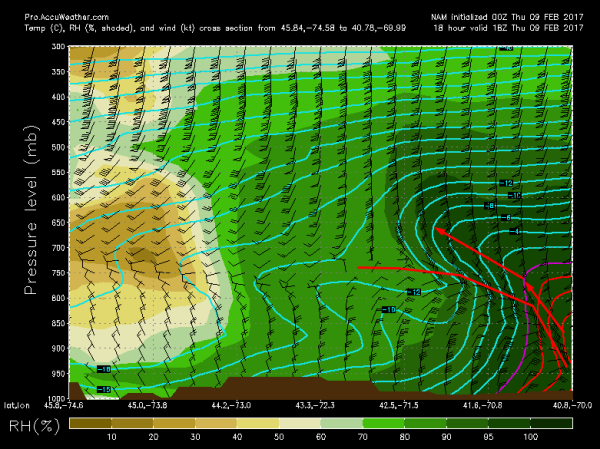 Why is upward motion maximized along frontal zones? For that we turn to isentropy. As the warm front sharpens and develops through the mid levels, air parcels rushing in from the east/southeast hit a wall of cold air. The sharper and steeper that wall is (e.g., the stronger the frontal zone), the faster they have to rise as they are bound to their potential temperature surface. Potential temperature is the temperature that an air parcel (a basketball-sized chunk of air) would reach if it was dropped to 1000mb (air warms as it drops). There are "surfaces" of potential temperature in the atmosphere and air parcels are bound to that surface in that they rise or fall based on the level of that surface in the atmosphere. In frontal zones, the slope of these surfaces become very steep, forcing air parcels to rise steeply resulting in intense upward motion. This whole process is aided by the explosive development of the surface low off the Mid Atlantic coast and by the fact that the explosively rising air can be vented quickly away by upper level divergence. With winds blowing away from each other in the upper levels, a void is left forcing air from below to rise to fill the area of lower pressure. This helps continue the explosive upward motion. The divergence is enhanced by jet streak coupling where the left exit region of one jet streak overlaps the right entrance region of another. Now that we've discussed all the complicated things that go into creating heavy snow bands, why do some get socked with snow, which some miss out? If you look at the radar image at the left you'll notice that for every powerful snow band, there's an equally powerful lull. This is explained by the age old wisdom “what does up, must come down”. Air in the heavy snow bands is rising rapidly (that’s why there’s heavy snow) which means that somewhere else, air has to sink rapidly. In these areas of sinking air, little or no snow will fall because snow can’t form in sinking air. The alternating zones of rising and sinking air are why some folks get nailed with the crushing snow bands and others escape with only moderate accumulations. These bands are notoriously hard to predict and can make the difference between 6" and 12" for any one place. That's why we give you the ranges in snowfall forecasts- you could end up under a heavy band and get the upper end of the range or it could go the other way. Be prepared for both! Meso/Micro/Synoptic scale — Mesoscale refers to a weather phenomenon that is “medium scale” meaning that it usually can fit inside a state or two and will last a few hours rather than synoptic scale features which will stretch across oceans and continents, often lasting several days or even weeks. Some microscale features do exist and are usually at the town/county level (for example, on a cold night with a strong inversion (warming temperature with height), Munjoy Hill might be several degrees warmer than Commercial Street just because of the elevation difference) however their tiny scale makes them irrelevant to most weather forecasting. Frontogenesis — Frontogenesis is the process by which a front is created. Fronts happen at (almost) all levels of the atmosphere and their beginnings can cause almost as much --— if not more interesting — --weather than the mature fronts themselves. When fronts are created in the low/mid levels, air is pushed together from different directions. This results in rising motion and extra energy being added to the atmosphere in that region as warm moist air is pushed up against cold dry air. 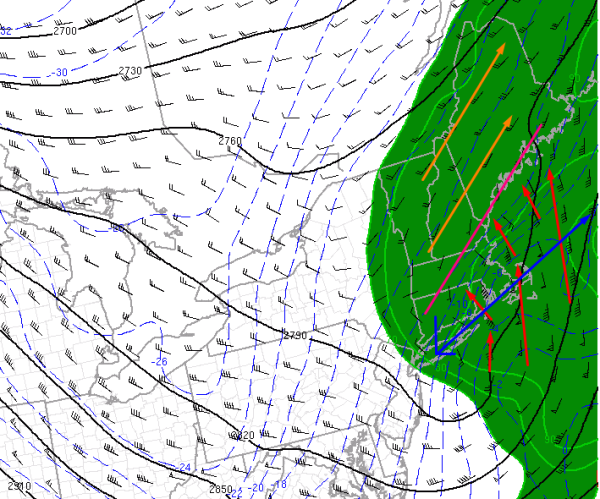 Frontogenesis areas are responsible for many of the mesoscale snow bands we experience in Maine!